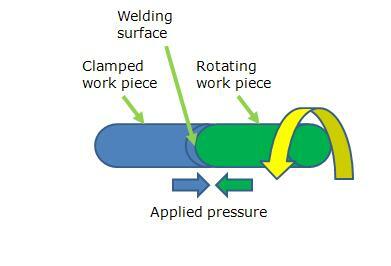 Friction welding does not require the work pieces to melt locally. Here, the work pieces to be joined are moved (normally rotated) against each others to generate frictional heat and at the same time the forces are applied on the work pieces to press them against each other. Once the initial join starts the relative motion is stopped and pressure is increased. The cumulative result is the work pieces at the contact surface gets soften and the applied pressure let them join much below melting temperature. – Reactive materials can be welded. – Dissimilar materials can be joined. – Joining can be done without much surface preparation. – Limited types of shapes can be joined. Ideal applications: Ideal for welding the spindles of the automobile axle to its cage, welding piston eye to shaft, welding drill pipe to drill rod.